High quality knives make all the difference in the world. 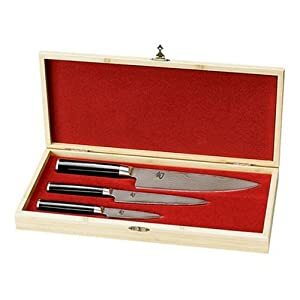 This set of Shun Classic knives would be a great starter set for the culinary student. Shun knives are especially sharp due to the angle of the cutting surface. 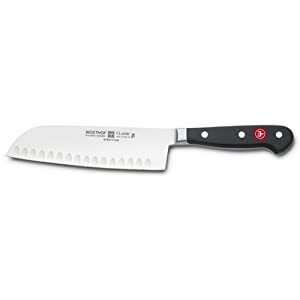 The cutting edge is ground to an angle of 16 degrees, whereas most German knives only use 22 degrees. The Japanese steel also allows the knives to hold their edge longer. 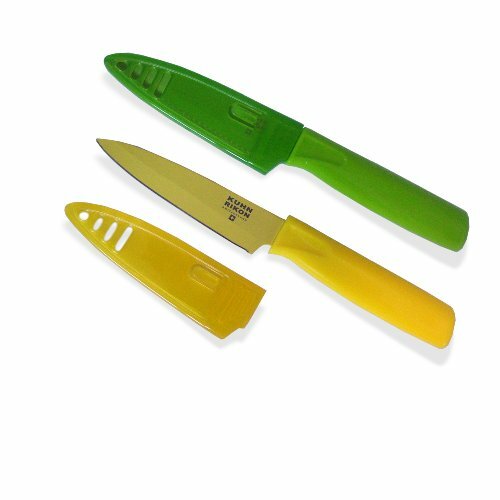 Here’s a great review for these knives. The best knives I’ve ever owned, bar none. They come with a razor edge and are easy to re-hone with just a few strokes on the Kershaw-Shun steel (well worth purchasing to accompany this set). The damascus pattern and perfectly crafted profile slice through darn near anything (food-like anyway) with ease. I also got a 9″ scalloped slicing knife and sharpening steel to round out the set. The weight and balance are perfect. They are designed for right-handed chefs with a d-shaped handle so if you are a leftie they may not be as comfortable or easy to use. Here’s a video describing the Shun Knife experience via Williams Sonoma. This sushi set designed by Stefano Giovannoni in 2008 features whimsical birds and clouds that will make your meal delightful. 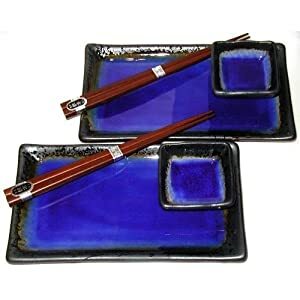 The set contains a small dish for soy sauce, large plate, chopstick rest in bone china, set of chopsticks in PA and a silk place mat. 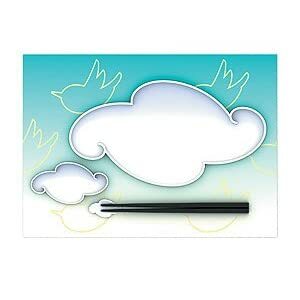 This is a limited edition, like many Alessi items, so you’ll need to hurry up to get one of these for your birthday. Here’s an interview with the designer. Are you ready to bring home the 寿司 [sushi]? 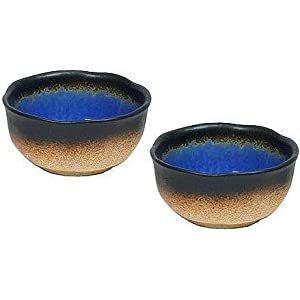 How about some 焼きそば[yakisoba]? 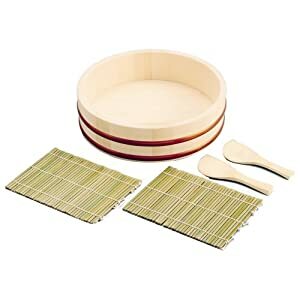 You’ll need the following items to set up a Japanese kitchen in your casa. This Sushi Oke Hangiri Temaki Set will get you ready to roll like California. You’ll need some rice for your sushi. 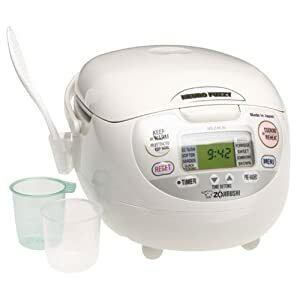 The Zojirushi 5-1/2-cup computerized rice cooker and warmer with advanced Neuro Fuzzy logic technology cooks and keeps your rice warm and ready to use. With this knife, you’ll be able to chop like Chen Kenichi in an epic radish battle. Remember what Morimoto says, your knife and chopping board are sacred. 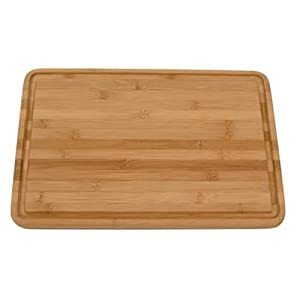 So save your knife’s edge with this bamboo cutting board. 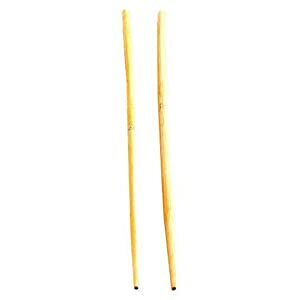 These long chopsticks are great for cooking. These knives are more than cute. They are very sharp, thin, and have a non-stick coating that makes skinning and cutting citrus a breeze. The fun colors also make them easier to find in your drawers. Chef Gerald Hirigoyen and Cooking.com shows you how to grate, peel, and section an orange.